The first game in the State of Origin series is fading in the rear view mirror and it’s time for Round 14 in the NRL. With questions over player availability and form, there has never been a better time for The Roar‘s NRL expert tipping panel to give their thoughts on the upcoming round. Last week, in an abbreviated round, AJ’s gap was shaved big time. He got a grand total of zero right, while The Crowd also got none. Tim got one, meaning he is on 59, two behind AJ and two ahead of The Crowd. Tom and I both got two of the four, but due to past poor performances, one win won’t make a season. Which, funnily enough is what most people would say if the Eels won this weekend. Round 14 gets underway with the Brisbane Broncos… Oh wait on. No it doesn’t. That was just the copy and paste from nearly every other week. They are actually playing an afternoon game against the Storm in the Victorian capital, so there is something. Obligatory pot shot at the Broncos out of the way, that’s going to be a ripping match against the Storm, and it won’t be the only one this coming weekend. The round actually gets going in freezing cold Canberra where the Green Machine will take on the men from the foot of the mountains, with four Origin stars likely to be backing up on just 44 hours of rest. The Panthers have been flying, but will it be one test too great for them? Time will tell as to whether their main men will be back to their best. South Sydney’s quartet of Origin stars get an extra two hours to rest, but that won’t mean much given they have double the length of time on a plane up to the Gold Coast. Still, they go in as favourites for a clash with the Titans. Jarrod Wallace will also be among that group backing up from the biggest rivalry in Australian sport. Saturday takes us all over the shop. We start in Christchurch where the Warriors will look to put one past the Sea Eagles, before we take a trip up the F3 where the Newcastle Roosters Knights will take on the Sydney Roosters. Then, it’s off to Darwin for the Eels and Cowboys. Who knows, would be the two words describing what to expect there. The Sharks and Tigers square off on Sunday afternoon with plenty on the line, then it’ll be a public holiday clash between the Dragons and their bogey team, the Bulldogs at Homebush. Don’t forget to submit your tips on the form below by 5pm (AEST) to be part of The Crowd as you take on the experts. I was going to steal the limelight and go first, but I’ll leave it to Tom. Oh yeah, and his rock solid tip of the week is back! Over to you. With four players backing up from Origin duties and a host of stars still confined to the physio bench, I can’t see the Panthers getting the better of the Raiders on a frosty Friday night in Canberra. Ricky will have the Green Machine primed for this one, and I wouldn’t be surprised if they ran up a big score on Penrith. A Rapana double feels inevitable. Up a Cbus Super Stadium, the Titans are desperate for a win to salvage something from what has been a very ordinary season. Problem is, they’re playing Souths. The Bunnies are in red hot form, and as the majority of their squad is made up of Burgess’, they’re largely unaffected by Origin. Bryce Cartwright has a better chance of winning a tackling contest against Steve Menzies than the Gold Coast have of winning this one. Manly will struggle over in Christchurch against a Warriors team who always peak around Origin time, the Roosters will continue to build with a comfortable win against the Knights, and despite the return of the Aussie hero, the Cowboys will heap further misery on the far from electric Eels. I’m predicting the Sharks to continue their mid-season surge with a scrappy win against the Tigers. Cronulla’s attack is slowly taking shape, and with their forwards returning to match fitness, they’ll grind out another close win. While over in Canterbury, well, the Bulldogs are still awful. They’ll struggle to score a point against the Dragons, who’ll put 30 on the dysfunctional family club. And in Tom’s “Rock Solid” tip of the week, take all that cash you won betting on the Blues and double down on the Storm to trounce the Broncos. Smith and Slater (if available) will be burning after watching the Maroons get smashed, and I’m betting they’ll have Melbourne up for this one. Storm by 14. My Green Machine will beat the Panthers because. What, you want reasons?!? We’ll fight and we’ll win. Don’t tell me the odds! South Sydney will beat the Titans because the Cardinal and Myrtle are playing their best footy since 2014. The Burgii are on fire and their bench is deep. Titans just don’t have the troops to repel them. Tipping the Warriors away from home is always a risk. And it’s a risk I’m going to take because Shaun Johnson is back. Yes, I know that’s not a good enough reason but it’s what I’ve got. The Roosters halves are better than the Knights halves. And the Ross Dog is still out. And Latrell Mitchell is good. And big Jared Waerea-Hargreaves is looking good again. Why have I picked the Eels? Because they must respond. Because the Cowboys outside backs are only ok. Because the Cows don’t travel good. Because I’m (probably) an idiot. Talking about sides that must respond, the Sharks are positively in that boat. The undermanned Rabbits made them look pedestrian. hey’ll have their work cut out for them against Ivan’s Bus, but I reckon they’ll do it. Cam Smith stood down from origin to concentrate on the Storms fortunes. The Storm like beating the Broncos and they are good at it. In Melbourne as well. After origin. With Glasby keen to displace Napa. The Bulldogs have an amazing record beating the Dragons. Go have a look at it. It ends on Monday. The Dragons will be too good for the ailing Dogs. The Raiders must beat the Panthers if they want to play finals. They will, but it’ll be a typical Raiders rollercoaster. James Maloney feasts on Canberra no matter what jumper he wears so Panthers still a massive chance. Manly have killed me tipping them recently. So Warriors to win. Eels have treated me even worse than Manly and with Mitch Moses out the Cowboys will mount them. Bunnies will topple Titans in a grind. I like the Bunnies. Roosters to murder the Knights and hold them to less than 10 points. The Bondi boys are building. Sharks and Tigers to go to golden point, Sharks win cos they’re still in decent nick despite losing last start. Broncos will beat Melbourne. They match up well at the bubble dome and I’m not 100% sold on the Storm. St. George just – Bulldogs will run them really close. What a week of footy we have coming up. There are plenty of genuinely unpredictable games here that have had me scratching my head over the last 24 hours. Running through the games, the game of the week is going to be on Sunday afternoon. Melbourne at home to Brisbane. Neither team have been in scintillating touch if we are being honest, but even with two straight wins, the Broncos are a bit up and down, so I’ll take the Storm with Cameron Smith not playing representative footy this year. The other two games really catching my attention this week are the Rabbitohs trip to the Gold Coast and the Sharks versus Tigers. The Titans defence has been poor at times, but they are a club capable of pulling off upset wins, especially against a Rabbitohs outfit with stars backing up. I’m still taking the Rabbitohs, especially after what they did last week but watch for that game to be a ripper. The Sharks will have Valentine Holmes backing up, against the Tigers who have no one backing up. Cronulla really missed Holmes last week and slotting straight back in at fullback should hand the Tigers another loss. Speaking of players backing up and there will be plenty of that in the early Friday game as four Panthers stars go straight from Melbourne to Canberra. All of James Maloney, Nathan Cleary, Tyrone Peachey and Reagan Campbell-Gillard are likely to play, but Penrith need to be out in front because, even given the way Canberra finish games, they will get mowed down. I’ll take the Green Machine. Saturday brings us a triple treat. The Sea Eagles have been up and down, but I can’t see them beating a refreshed Warriors outfit at close to full strength (pending the fitness of Roger Tuivasa-Sheck), while the Roosters and Knights – with a few former Roosters – should put on a pretty good show, but ultimately, Trent Robinson’s side take the chocolates. The last game on Saturday goes to Darwin, where I’ll take the Cowboys in what are likely to be 30-degree temperatures. The Queen’s Birthday public holiday game, as is fast becoming a tradition between the Bulldogs and Dragons, should see the Red V get back in the winners’ circle. It’s an absolute bogey team for the Dragons, who have lost 11 of the last 12 against the blue and white. Their form is strong enough that they shouldn’t lose out of a bye or lose two straight right at the moment. 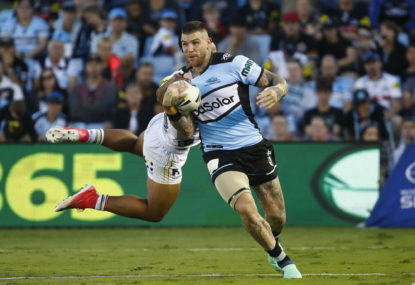 Some of that does depend on how their stars back-up from Origin, but then, some of the Bulldogs effort also relies on David Klemmer backing up well. Crowd tipping will close at 5pm (AEST) on Friday evening. Be sure to submit your tips on the form below before then to make your opinion count as part of The Crowd.